There is lots of great turf to run on the west side of the Bay but a few runs stand out to me. My criteria for selecting these runs is entirely subjective. I'm sure I've missed some good ones, so feel free to leave more suggestions in the comments. Presidio (Battery to Bluffs Trail) - Start at Crissy Field and fly along the bay. Then climb under the Golden Gate Bridge. Run past historic batteries with spectacular views of the Pacific Ocean. With plenty of hills to challenge any almost any level of runner (and big thrilling decents to match). 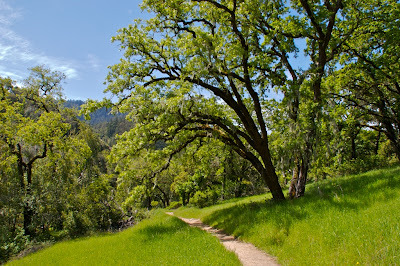 Saratoga Gap/Long Ridge - A popular route with mountain bikers is also my favorite single track route in the bay area. Good climbs, bomber drops, plenty of shady, plenty of big open views. Spectacular in every way. The Dish - A number of years ago they paved over the dirt trails of The Dish so it’s not technically a trail run anymore but I can’t think of many better ways to hill train than climbing the rolling slopes of Stanford’s famous Dish Trail. Nice views from the top, great hills, and big fast drops. Crystal Springs - If you’ve driven along 280 you know the Crystal Springs Reservoir well. 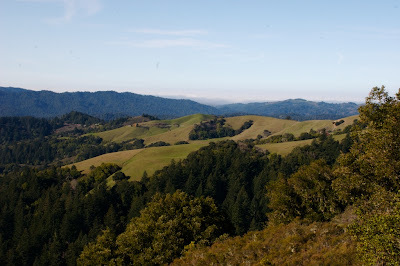 What you may not know is that the Crystal Springs regional trail connects redwoods to open meadows, and 17.5 miles of likeside trail. Windy Hill - Choose the flat or the climb, either way - you’re going to climb... On a drizzly afternoon running across Hamm’s Gulch (the flat), or up the steep, open slope of Wind Hill (the climb) is a thrill. I typically piece together about 4 miles of ungulating trails around the base, then make a run at the top, turning around once my legs tire, gliding back down to the parking lot. St. Joseph's Hill - Start from the "trailhead" on E. Main Street on a stormy afternoon and power to the top of “St. Joe’s” or lump on the miles on the Los Gatos Creek Trail - or both! Burrito's at Andale afterwards. 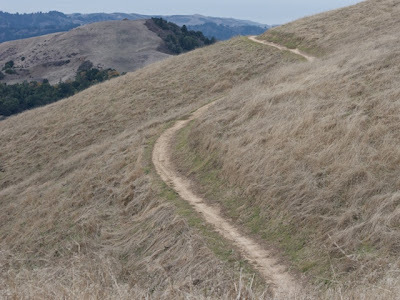 Russian Ridge, Borel Hill - Short and sweet with fantastic views atop a sunny, windswept peak. It’s hard to piece together a long training run from the trails around it, but the view from the top is hard to beat. Shoreline Park - On the one hand the views are stunning, the temperature is generally cool, there are miles of trails to loop around, and the terrain stays very level. On the other hand strong winds and foul odors from the bay limit what would otherwise be a perfect environment to an afternoon run. 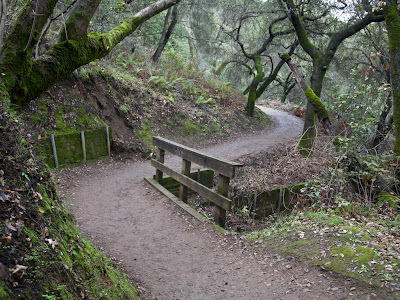 What are your favorite local trail runs?